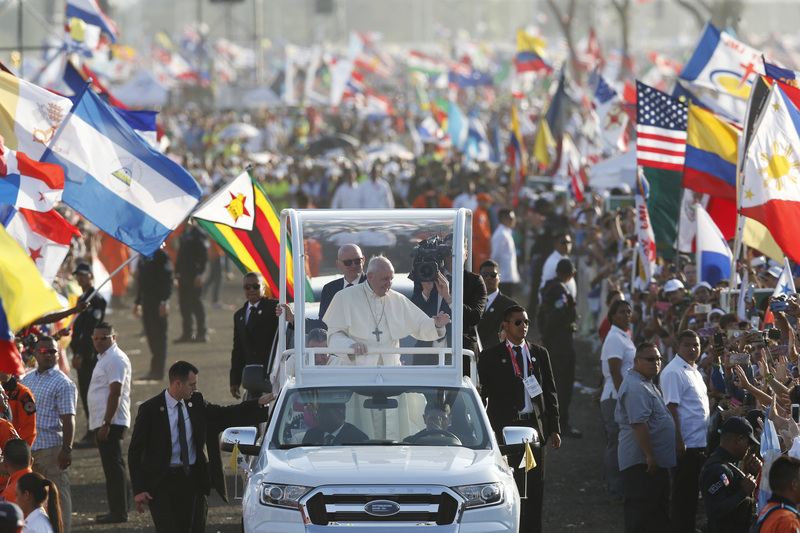 Pope Francis issued a powerful “wake up” call to hundreds of thousands of young people from 155 countries, in his homily at the closing mass of World Youth Day in Panama on Sunday, Jan. 27. He urged these young people from all continents, as they waved the flags of their home countries, to “realize that you have a mission and fall in love; that will decide everything,” as Father Pedro Arrupe, former Father General of the Jesuits, once said. The vast majority of young people had slept in tents or sleeping bags in the extensive Metro Park overnight, after attending last evening’s prayer vigil with the pope. At six o’clock this morning, they received a stirring wake-up call over the public address system, to the sounds of drums and music. But that was nothing compared to the wake-up that Pope Francis issued to them in the presence of the presidents of Panama, Costa Rica, Colombia, Guatemala, Honduras, El Salvador, and Portugal. Also, at the side of the altar stood the pilgrim statue of Our Lady of Fatima which had been brought here from Portugal. Cardinal Kevin Farrell, President of the Vatican’s Dicastery for the Laity, the Family, and Life, which is co-organizer of the W.Y.D. along with the local church, announced that the next World Youth Day will be held in Portugal. He did not give an exact date, but it is widely expected to be held in 2022. In his homily at the festive Eucharistic celebration, which was concelebrated by 450 cardinals and bishops from many countries including the United States, and 4,000 priests, Francis told them that Jesus was inviting each one present to join him in his “mission” today, not tomorrow. He did so by drawing on the Gospel of the day which tells how, as a young man, Jesus began his public ministry when he went into the synagogue in Nazareth and stood up “and put into action God’s dream” by “proclaiming good news to the poor… bringing liberty to captives and recovering of sight to the blind, setting at liberty those who are oppressed, announcing the year of the Lord’s favor” (Luke 4.20-21). Pope Francis explained that “Jesus reveals the now of God, who comes to meet us and to call us to take part” in this same mission today. Francis then went on with the festive celebration, protected from the sun under a great canopy, as the more than one hundred-strong choir led the singing, and prayers were said in the different languages. At the conclusion of the joyful celebration, Francis thanked God “for having given us the opportunity to share these days together and to experience once more this World Youth Day.” He also thanked Panama’s president, Juan Carlos Varela Rodríguez, and the presidents of the other nations present. He thanked especially the Archbishop of Panama, José Domingo Ulloa Mendieta, for his “generosity and hard work” in hosting this World Youth Day, and the bishops of neighboring countries and their communities for providing accommodation and assistance for this great event. Pope Francis then concluded the celebration by thanking the young people and entrusting them to the protection of Our Lady, and asking them to pray for him. After mass, Pope Francis drove to the nearby Casa Hogar El Buen Samaritano Juan Díaz, built in 2005 by the local church to provide assistance to young people and adults affected by AIDS who are deprived of familial and economic assistance. Once he had greeted and spoken to them, Francis drove back to the nunciature for lunch. Later in the afternoon he will go to a stadium to thank the thousands of volunteers from many countries who had worked to make the W.Y.D. such a success. Futile pursuit of change is for the socialist, the malcontent, the immature but the work of salvation is fulfilled; the entire work of the redeemer is done and complete. For more than 2000 years human beings, young and old, male and female, have plumbed the depths of the mysteries and there have always been rebels who invented the same heresies time after time. I am pleased to search for the idolatry of youth in his words, and find it absent. Young people are still ignorant, inexperienced and immature and need the steadying hands of the older adults. The Christ child has been conceived, and born and grown to maturity and fulfilled the will of His Father completely. We are NOT waiting for another Messiah. It is accomplished. Now, we await the culmination of history and presumably there are still some accomplishments planned and willed by Our Father for us, the people of God, to fulfil before the Lord returns in all his Glory.